The bench press has been a staple in gyms across the world for years for increasing upper body strength. Particularly in the chest and shoulders. On every Monday (universal chest day in the meathead world) you can walk in to any gym and there will be guys in line waiting for their chance to crush their pecs. There are competitions both casual and professional on this very lift and the number one question you will always hear a couple of well built guys ask each other is “how much do ya bench?”. There is a reason why you see so many people in so many gyms across the world designing their upper body programs around the bench press. Because it works. If you are looking at putting on upper body mass, or performing better give the bench press a try. Lie down on the bench and position your body so that your eyes are directly under the bar. Get your feet under you and think about setting your shoulder blades back and down. Unrack the bar and slowly lower it to the chest. On the way down think about actively pulling your shoulder blades together and “pull” the bar towards your chest. Once the bar has reached your chest, think about planting your feet into the ground and press the bar back to the starting position. Set up with the dumbbells over your chest with arms fully extended. Actively “pull” the dumbbells down to chest level while keeping your feet firmly planted on the floor and ribs down. Once you reach chest level drive your feet through the floor and return to the starting position. So there you go, the basic bench press. 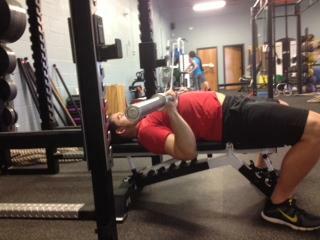 If you want to start seeing some results in upper body strength and mass the bench press is a must. 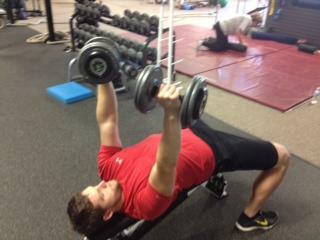 A couple notes: if you get shoulder pain while pressing with the barbell, switch to dumbbells. It will allow more rotation and extension throughout the shoulder capsule. 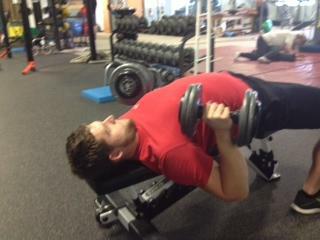 Be sure to work on thoracic mobility and chest extension if you get pain in the front of the shoulders while benching. Enjoy!